Apply foam boot to the horse’s lower leg. Apply the wrap as you would a polo wrap. 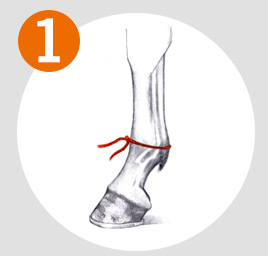 Starting in the middle of the cannon bone, securely apply the wrap around the boot, wrapping down to the fetlock joint with a 45 degree layer that cups the ankle and wrapping back up the leg to secure the boot with additional support. Fasten wrap with hook and loop strip.